Getting to know your child really well from infant to child to teenager is one of the joys of parenthood but we get so busy scheduling, organizing activities and meals, plus very often, working outside the home, that it's easy to forget to have a good twenty minutes of conversation with our kids several times a week. The older they get the longer the conversations but frequency is important to build the mother-child bond and get to know your child really well. One of the major tenets of Parental Intelligence is understanding your child's mind. This means learning about what are called their mental states that include thoughts, feelings, intentions, imaginings, and goals. Language is of course a primary means of communication that grows with age. Let's think how to learn about the mental states through conversations at different stages of development. By three and four months your baby starts to coo. When you coo back by mimicking her sounds and then adding more of your own in a sing-song voice called "motherese" your baby feels listened to. This is the beginning of conversations with your baby. A baby cries to say he is hungry or wet or needs stimulation to communicate his needs and intentions. We can respond not only by feeding and changing a diaper but by conversing at the same time. This stimulates your baby's eye contact, body movement, and pleasure in hearing your voice that has been known since the baby was in utero or when first adopted. Preschoolers have a lot to say if we take the time to let them finish their sentences that can be interrupted by pauses and short fits and starts of incomplete phrases when they are young. It's important to wait until they really seem finished speaking and getting their thoughts out or we will miss out on what they're intending to say. It's fun to enjoy the nonsensical sentences that roll out as well as the clear communications. It's a delight for kids to know you're listening not only to serious thoughts and feelings but what makes them laugh. Kids love to tell jokes that sometimes don't really work but they find them hilarious anyway. They love when they know they can make you laugh. Tell them about your day, so they get to know what you are doing while they're in school. This two-way sharing gives teens an incentive to share more about themselves. It's important to pick up on a worried look or frustrated expression and notice out loud that you wonder if something is bothering them. Or, if they suddenly smile or laugh, try to join in with what they find funny. The Pleasure of Knowing Your Child Better and Better. In many different ways, you will find you are adding on to the many ways you already talk to your kids. Instead of giving instructions and advice, there will be more interchanges, conversations that show you how your kids understand the world around them. 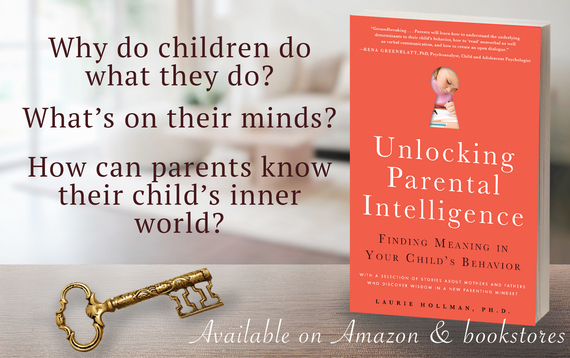 Laurie Hollman, Ph.D. is a psychoanalyst who writes about Parental Intelligence, child development, and parenting. Look for her book, Unlocking Parental Intelligence: Finding Meaning in Your Child's Behavior on Amazon, Barnes & Noble, Familius and wherever books are sold.